Chroma trap has developed a new protocol that further extends the many advantages of its popular Chromatin Immunoprecipitation Sequencing (ChIP-seq) assay kits. 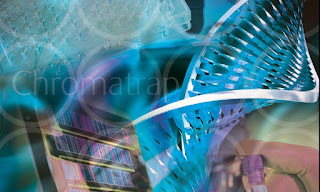 Key developments for the Chromatrap ChIP-seq kit (version 1.2) include high quality chromatin can now be achieved via sonication or enzymatic digestion; high and low abundant enrichment is possible from small chromatin samples; improved antibody binding; greater chromatin loading flexibility and the ability to use increased slurry volumes for difficult samples. Chromatrap’s ChIP-seq kit uses solid state technology in parallel with high throughput sequencing to deliver a streamlined ChIP-seq protocol from small cell numbers and low chromatin concentrations. Specifically adapted for broader chromatin concentrations, Chromatrap ChIP-seq combines the dynamic range of Chromatrap with the downstream analysis power of deep sequencing. This allows faster, more reproducible genome wide identification of TF binding sites and specific DNA associated protein modifications. With no limitation in scale or resolution, Next Generation Sequencing can elucidate the role of TFs and epigenetic marks on gene transcription and epigenetic chromatin status. The Chromatrap ChIP-seq kit allows the user to perform up to 24 ChIP assays from cell collection through to immunoprecipitation, including up to 10 chromatin sample preparations. The kit provides all of the major components required for performing ChIP assays to obtain high quality DNA for Next Generation Sequencing library preparation. With the Chromatrap ChIP-seq kit you can sequence from as little as 1-50 µg of chromatin and perform up to 10 library preparations form a single IP. A complete ChIP-seq assay can be completed in just five days. With selective and sensitive enrichment of low chromatin loading and optimised elution buffer chemistry the new version 1.2 of the Chromatrap’s ChIP-seq kit enables preparation of high quality and quantity of immunoprecipitated DNA. 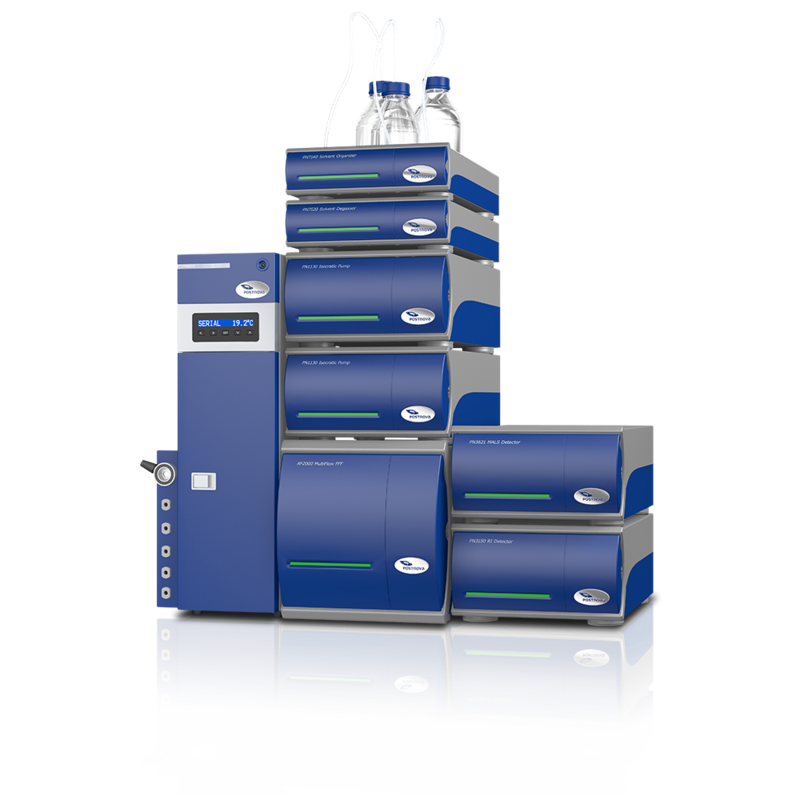 Now scientists in environmental, food safety, pharmaceutical and industrial/petrochemical laboratories can rely on a new flexible and configurable high-pressure ion chromatography system designed to deliver exceptional performance, productivity and efficiency. 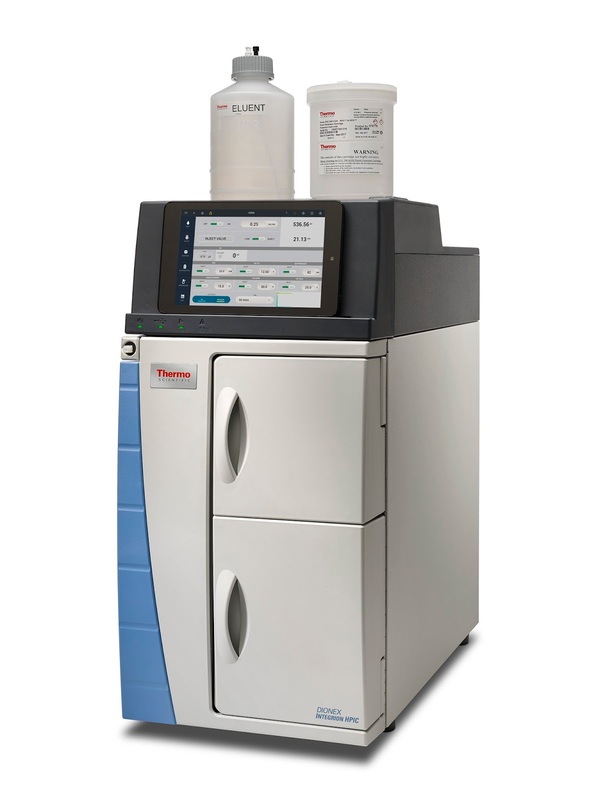 The Thermo Scientific Dionex Integrion High-Pressure Ion Chromatography (HPIC) system, the newest addition to the Thermo Fisher Scientific ion chromatography portfolio, is intuitive and easy-to-use, and capable of addressing challenging laboratory workflows. * Easy-to-install IC PEEK Viper Fittings that enable easy operation and minimize peak dispersion and band broadening—ultimately improving chromatographic resolution. * Detachable tablet with local language support that allows the flexibility to access IC controls even while away from the instrument. * Consumables device monitor that regulates installation errors by logging and tracking both system and consumable performance—storing data in a secure, cloud server that improves preventative maintenance and maximises uptime. * Thermally regulated detector compartment that provides extended life to consumables. 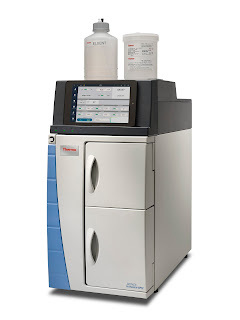 * Thermo Scientific Dionex Chromeleon Chromatography Data System (CDS) software to streamline workflow from samples to results quickly and easily. Also new to the Thermo Scientific IC portfolio is the Dionex Aquion IC system, which brings reliability in a compact platform and the simplified operation needed for routine IC analysis. 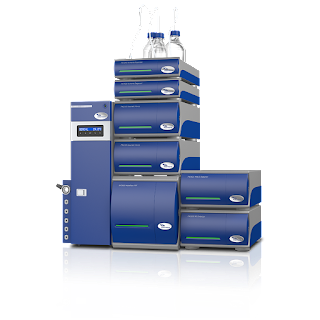 Based on the company’s reliable ICS-1100 platform, the system features electrolytic suppression for consistent performance and ease-of-use, an optional column heater for improved reproducibility and an optional vacuum degasser for improved baseline stability. Innova Biosciences, a specialist provider of bioconjugation products and services, today announced the launch of new red, black and blue 400nm LATEX conjugation kits. 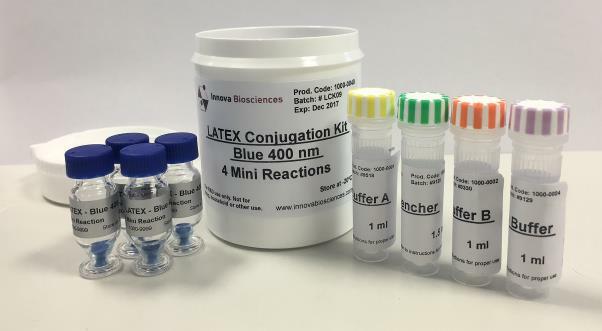 Innova Biosciences’ LATEX conjugation kits are one-step kits for the covalent conjugation of antibodies and proteins to specially treated latex beads, for use in the diagnostics field and across other applications. The new conjugation kits are easy to use, and offer quick, effective conjugation of antibodies, proteins and peptides to latex beads, offering the potential to simplify and improve assay development while reducing development timelines. Additionally, as a variety of colours are available, the range enables multiplexing and therefore maximum flexibility in assay design. The kits are suitable for use in development of diagnostics, in lateral flow assays, and across a range of other applications, and are fully compatible with human serum. Conjugation to latex particles using conventional methodology is complex and time-consuming, and typically requires extensive optimisation and relatively large quantities of antibody, with aggregation often a major problem associated with covalent conjugations, and extensive pH optimisation required for passive conjugation techniques. 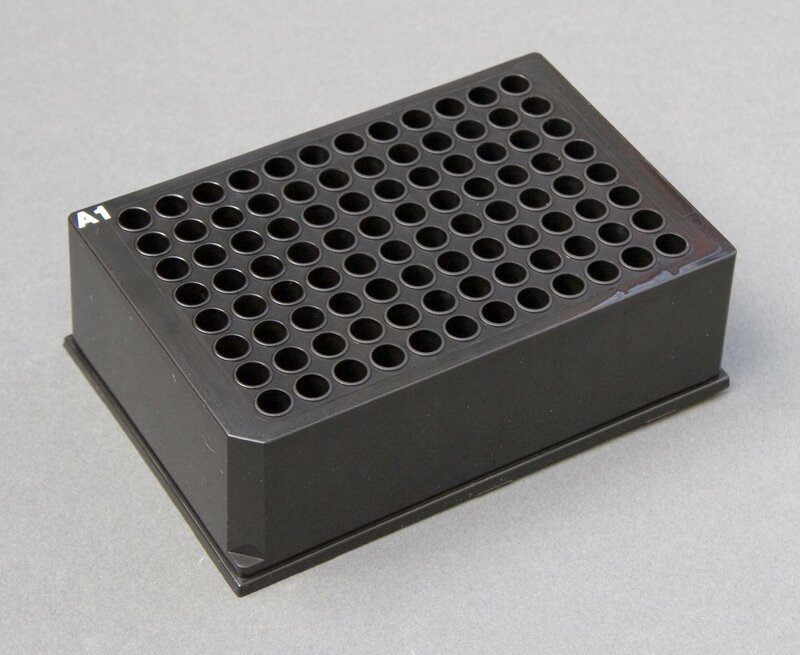 Available from Porvair Sciences is a black 96-well deep well plate, offering a working volume of 1ml per well, that in conjunction with black sealing films ensures that light sensitive assays and samples are not degraded by exposure to light, even over long-term storage periods. Manufactured from polypropylene, Porvair's black deep well microplate has excellent heat and solvent resistant qualities. Using only ultra-pure grade polymer means that the black deep well plate has near zero leachates ensuring long-term sample integrity. The black plate is fully validated RNase and DNase free allowing it to be used with even the most sensitive biological samples. Benefiting from a cylindrical well design with round bottoms, Porvair's black 96-well deep well plate allow optimal mixing and easy sample recovery. Precisely manufactured to ANSI / SLAS dimensions – the black 96-well deep well plate is fully compatible with all commercially available microplate readers and automated liquid handling equipment. Cancers evolve over time in patterns governed by the same natural laws that drive physical and chemical processes as diverse as the flow of rivers or the brightness of stars, a new study reports. Researchers believe that in the future, they could predict how a cancer will grow and develop by applying natural laws to single genetic snapshots taken from a cancer. The intriguing research raises the possibility that doctors could take clinical decisions on how an individual patient’s cancer will change, and what treatments should be used, by applying mathematical formulas to tumour biopsies. Scientists at The Institute of Cancer Research, London, and Queen Mary University of London (QMUL), used a wealth of data – generated from more than 900 tumours of 14 different types – to show that many cancers evolve in particular patterns that can be predicted. The study, published in Nature Genetics, was funded by a donation to The Institute of Cancer Research by Chris Rokos and by organisations including the Wellcome Trust, Cancer Research UK and the Medical Research Council. Scientists at The Institute of Cancer Research, London, and the Cancer Research UK Beatson Institute in Glasgow, showed that a type of signal called transfer RNA plays a key role in driving collagen production to increase the blood supply to tumours. The researchers found that fibroblast cells that were activated by malignant breast tumours produced much more of a type of transfer RNA called the initiator methionine tRNA, than they would normally. The increase in this particular transfer RNA allowed fibroblasts to increase their production of type II collagen.